John Walker, the chairman of the Macquarie Group of Companies Korea and WTF President Choue Chungwon address memebers of the media at the Hanwha Building in downtown Seoul. 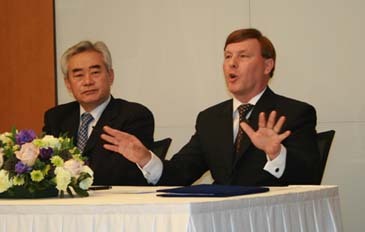 The Macquarie Group of Companies Korea and the World Taekwondo Federation announced their global partnership agreement at the Hanwha Building in downtown Seoul on March 31, 2008. Over 30 press members and business leaders from both groups attended the conference. John Walker, the chairman of the Macquarie Group of Companies and Dr. Choue Chungwon, the president of the World Taekwondo Federation, were both in attendance to talk about the details of the partnership. The opening words were given by Dr. Choue. "Macquarie Group of Companies in Korea will be a global Partner for five years in a demonstration of its long-term commitment to Korea" announced the WTF president. Dr. Choue was also optimistic about how the WTF's new partner will create awareness of taekwondo both at home and abroad. "Macquarie's involvement with the WTF will be a huge boost for taekwondo, as it will enable us to promote the sport better in Korea and overseas," added Dr. Choue. After Dr. Choue was finished, John Walker gave his words about the global partnership. He has been doing business in South Korea for year years and has had a chance to watch its rapidly growing economy first hand. "This is one of the most significant sponsorships done by us anywhere in the world" said the Macquarie Group of Companies Korea chairman. The sponsorship is apparently in the excess of millions of US dollars. The Macquarie Group of Companies Korea is interested in developing ties with South Koreans. "Most Korean families experience taekwondo in some way. We hope that this agreement will allow us to make that experience even more rewarding for them" exclaimed John Walker. On the agenda in terms of community outreach is the "Enhancing Young Lives" program. The program would provide equipment and other benefits for children from poorer families who normally wouldn't be able to participate in taekwondo. "Taekwondo is great for the development of youth and builds a sense of discipline that many miss out on while growing up" replied Mr. Walker when asked about the benefits of taekwondo. The WTF is well known throughout the world as it has over 60 million taekwondo practitioners spanning 188 countries. Taekwondo will also be a featured sport at the Beijing Olympic Games. Through this global partnership the Macquarie Group of Companies demonstrated their commitment to enhance the world's awareness of taekwondo and make it more available for the underprivileged. In 2000, Mr. Walker established Macquarie's Korea business with only five staff members. It now consists of 13 businesses with seven funds. Mr. Walker has led major infrastructure projects and privatizations globally and has been instrumental in raising significant private equity. He established Macquarie's first overseas raised-and-based investment funds in both infrastructure and general private equity. In Asia, Mr. Walker has over sighted a series of transactions totaling over US$10 billion. He has been part of the privatization of government owned businesses and new infrastructure projects. He has also been involved with the advisory of energy companies and government owned assets. Before starting in South Korea, Mr. Walker was the global head of government business for Macquarie bank. The bank had roles in Canada, the USA, the United Kingdom and Asia. Prior to joining Macquarie Mr. Walker was the executive vice president at Bankers Trust, Australia. He started this job after making the transition from the public sector where he held senior roles for the government in New South Wales and the Australian Capital Territory.